My predictions for Tayside’s top three clubs this season look like dumping the entire contents of a hen house over my head. My bold assertion that both Dundee sides would be in the Premiership next season is already looking messy. 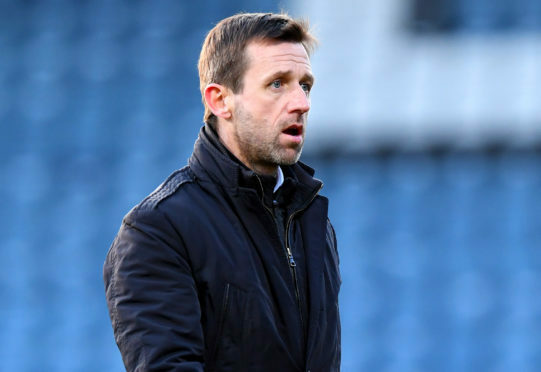 With Dundee shaky at the back and shot shy in front of goal, Neil McCann’s side are too close for comfort to the basement scrap, scrambling my suggestions that a top six finish should be their aim. Meantime, my hopes that St Johnstone would finish in their customary top half of the table have been blown. Saints fans are currently wearing scowls in search of a grievance, and they don’t have far to look. Manager Tommy Wright, just months ago tipped as a potential contender for jobs at Northern Ireland, or Aberdeen FC, if they fell vacant, is getting flak from some supporters. With Saints tumbling out of the top six, which previously seemed theirs by right, it looks like serious rebuilding is needed at McDiarmid Park. Critics of Wright are questioning whether he can remould the team and return them to previous glories. Presently, the chairman is avoiding major flak, but as Stephen Thompson discovered at Dundee United, there’s a fine line between looking after the finances and keeping the football team in good health. When it goes wrong on the pitch, the boardroom is the next target after the manager. Speaking of which, there’s little solace for Dundee United, where even diehard fans long ago gave up on any slim hopes of winning the title for promotion. Many are now even wondering if a play-off place is beyond them. Rapid progress is required from Csaba Laszlo’s side as the faith of supporters comes perilously close to breaking point. You can’t make an omelette without breaking eggs. It now looks like all three clubs will smash my favourable predictions of success for them this season. * For some people ethics is a county near London, not a moral view of the world, so it is with the Bradley Wiggins case. Wiggins has been accused of crossing an ethical line in his use of an asthma drug. Therein is a problem – who decides what is ethical and what is not. Is it ethical for one competitor in sport to be able to afford top quality lightweight equipment, or to come from a well-to-do background which affords coaching and training opportunities which others struggle to access? The dividing lines are battleship grey. It’s like the ridiculous phrase ‘legal loophole’. There’s the law and there’s not the law. It’s the same thing with the accusations that Bradley Wiggins crossed a mythical ethical line in his usage of an asthma drug. It was either legal or illegal, and the fact is that it was completely legal. Everything else is a smokescreen. If the authorities wish to ban drugs which give competitors with asthma or other ailments, a fighting chance to overcome those issues, then do so, but don’t hide behind the foggy murk of ethics, which has as many meanings to as many people as Bradley Wiggins has had punctures.